Our earlier plan was to go to Chikmagalur by 7 or 8, find a hotel, cover Mullayangiri, Sitalayangiri, Bababudangiri and then head to Kemmangundi and the surrounding places the next day. But we made a last minute change in plans prompted by the driver – we decided to go to Kemmangundi first and then go to the peaks the next day. The driver was of the opinion that it is easy to find a homestay, and we should do that. In hindsight this was a good decision because the places that we wanted to cover near Kemmangundi was packed and we couldn’t have covered them all if it was scheduled for the second day and Bababudangiri was closed, so there wouldn’t be enough places for the first. We had breakfast on the way and then headed to Ballavara which is in the foot of Kemmangundi. 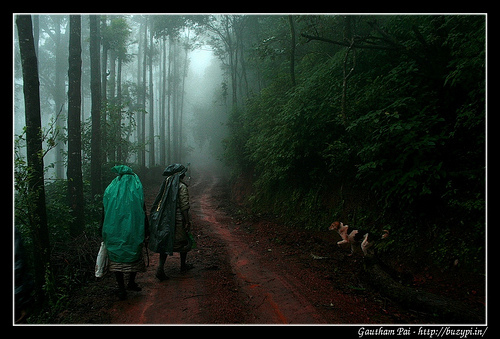 This was not my first trip to Chikmagalur. I had been on a 3 day trip to Horanadu, Kalasa and Kudremukh in January and it was the same feeling – as soon as you enter Chikmagalur you get this feeling that the air has suddenly become pure, the landscape changes and you can feel the difference. 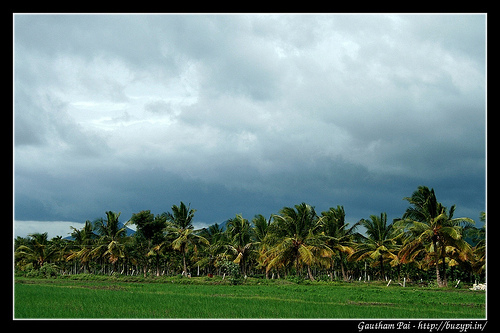 We were very close to Ballavara when we had our first scene of the day – blue skies, a hill in the remote landscape, with coconut trees and lush green grass fields in the front. We stopped for snaps. One important change I did in this trip was to not use the UV filter on my wide angle lens – this turned out to be good because the colors were more natural. 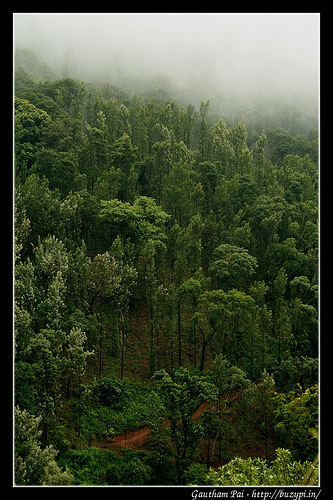 I had noticed a bluish tinge in my landscape photos from the Coorg trips and was concerned about it. It turned out to be because of the UV filter and removing it worked. It was 10am by the time we reached Ballavara. We found a homestay but it turned out to be expensive, and then we found another one by the name of Rangers Camp – it was a pretty decent deal – it worked out to roughly Rs. 400/- per person and we went for it. One headache off. We then went to Kalhatti falls. 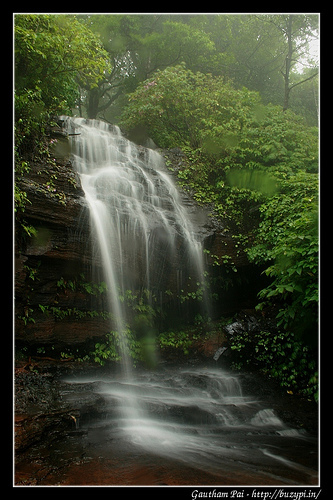 Kalhatti falls (or Kalahasti falls) is located at a place called Kallattipura. 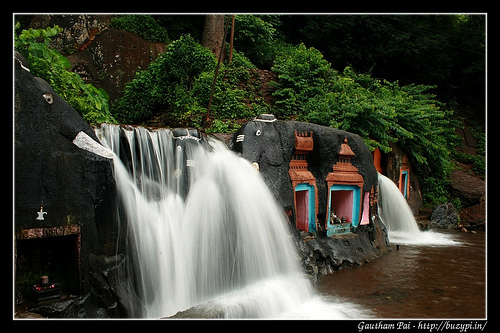 There is a small Veerabhadreshwara (Siva) temple here. There was slight rain when we reached this place – but that meant low light and excellent for waterfall photography. 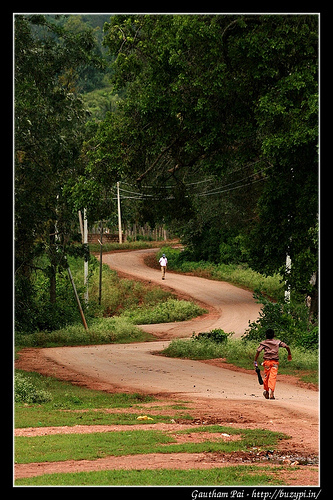 After satisfying ourselves with a whole set of snaps, we went to Kemmangundi. The route from Kalhatti falls to Kemmangundi is amazing – the weather was awesome, the air was cold, there was light fog, and there was a hint of Nilgiri scent in the air – a good combination of joy for the senses! It was close to 12 by the time we reached Kemmangundi. 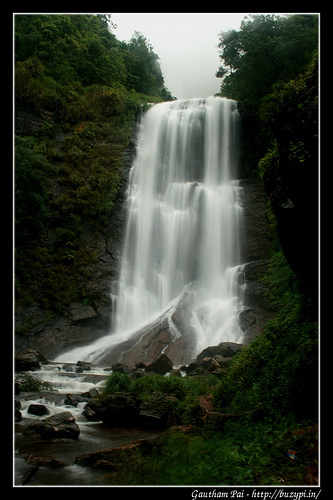 We decided to lunch there and then continue onto Z-point and Shanthi falls – which is just 3km from Kemmangundi. Lunch was not ready, so we treated ourselves to some macro photography – looking for droplets on leaves and flowers and anything that is worth remembering. Post lunch, off we went to Shanthi falls. 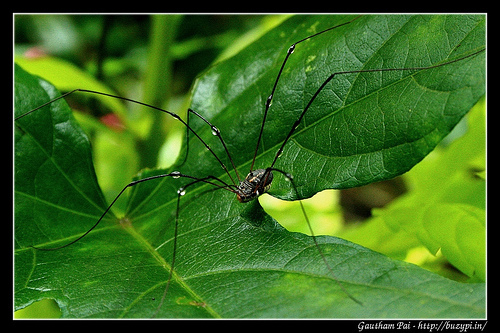 By the time we reached Shanthi falls, we made a leech check and lo, I had 2 of them on my leg. I pulled them off and found atleast 3 more in my jeans! Rains here are unpredictable especially in this season – it was not raining when we reached Shanthi falls – we clicked a few snaps and then it started raining heavily. We had our expensive cameras with us, the paths were very slippery, there were quite a few visible leeches in the path, and we were not sure if we could get a good view at Z-point considering the fog. So we decided to go back. We then reached a point from where we had to take a jeep to Hebbe falls. The driver demanded 800/- and we agreed and so another leech bite later, we were on our way to Hebbe falls. This journey to Hebbe is something I am not going to forget for quite some time to come. This single journey to Hebbe and back was worth more than the entire trip put together. The road to Hebbe is bad – I mean really bad – believe me, I have had my share of bad roads and Mandalpatti comes close – but I wouldn’t call these roads motorable even by Indian standards. I had newfound respect for the Commander after this drive and the driver – well you can see the photo below and decide for yourself. 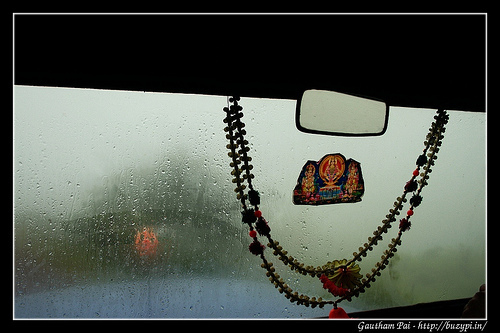 The road was hardly visible, it was raining, there was fog, the roads were bad but he didn’t seem to care. It seemed like he could do these routes blindfolded. There were streams across the road, there were places where we could only see rocks and it was hard to believe that any vehicle can go on these roads. At some places, the roads were dug up to make way for the water to pass across. But the Commander moved on… and, by the way, it was not a 4-wheel vehicle. We also had a few places where the roads were extremely narrow and the vehicles had to scrape each other to pass! 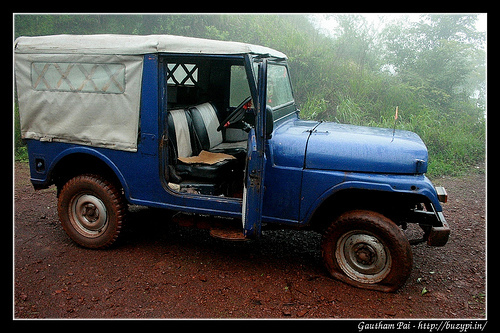 It was only at about 2km from our final destination when the Commander gave up – we had a flat tyre. The driver didn’t have the necessary equipment to replace it – and so he told us we need to wait until another vehicle passes by and then he will be able to replace it. This was our chance to walk through the serene estate – and we told him that we will do the rest of the distance by walk and if he happens to fix the tyre, he can pick us up. It rained slightly when we reached the point where the jeeps stop. We waited for a moment and then decided to continue – lest we miss the falls as it was getting dark. You need to trek a little distance, crossing 3 streams on the way. The falls is not visible until the last moment – we could hardly hear it either because of a stream that flows by and here it was – flowing so calmly. I didn’t have any expectations from the falls. I just wanted to go there, feel it and return – but Hebbe falls turned out to be the best falls I have seen till date. The magnificence, the calmness with which it falls, the weather all made it seem like a dream. It felt like the water was falling in slow motion and I could easily picture a scene from Planet Earth. There were no people when we reached and this added to the wonder – as it gave this feeling of a magnificent discovery somewhere in the middle of a dense forest when you least expect it. I was more keen on feeling the moment than clicking pictures. The droplets from the falls was settling very quickly on the lens, and long exposure almost seemed impossible. 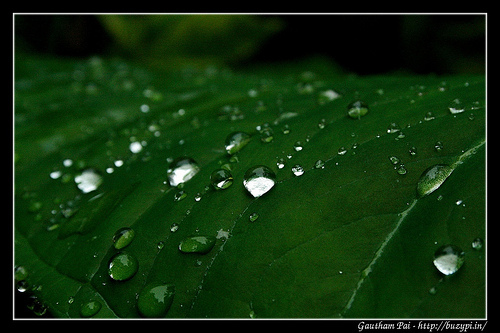 We had to wipe the lens clean, keep it covered with a cloth and open it only for a short moment to get a good droplet free snap. Post this, we headed back to Rangers Camp. We were tired with the day’s activities, but were pretty happy and content. I had a few more leech bites – taking the count for the day to 7; I emerged the unanimous winner! I will post the day 2 experiences soon.